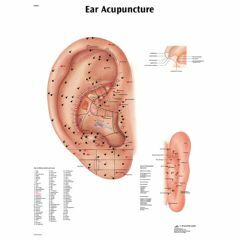 AllegroMedical.com presents The 3b Scientific Anatomical Chart - Acupuncture Ear, Laminated . Laminated finishing is the most popular and most durable. The 125-micron lamination ensures the chart does not curl up at the edges and the UV treatment ensures the chart does not get a faded yellow color over time. Human anatomical charts and posters are helpful aides in teaching human anatomy, patient education and medical studies. All anatomy charts are available in 19.7 x 26.6 in (50 x 67 cm) unless otherwise stated.